Corrugated sheets roll forming machine manufacturer. On April 17, the newest design Corrugated Sheets Roll Forming Machine is arrived Malaysia Customer’s factory. The customer is very satisfied with the machine quality. Corrugated Sheet, also called Corrugated Iron, is a building material composed of hot-dip galvanized steel, cold-rolled steel formed into corrugation. The Corrugated Sheets are introduced about Depth and Pitch. Depth is the height from the top of the wave to the bottom. And Pitch is the distance between between two waves. It is samed as common roofing sheets that the depth and depth of corrugated is uniform and easily transport. And overlap neatly when joining two sheets. In 2017, We also exported a Mini Orb Corrugated Sheet Roll Forming Machine to another Malaysia customer. Which depth is only 6mm while pinch is 12mm. This machine is special because the pintch is only 76mm and uniform. 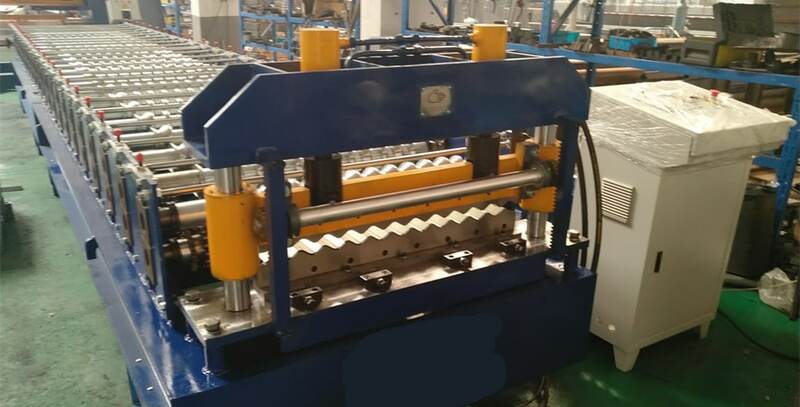 So the machine can form different width material without any adjustment of the roll forming tools. except adjusting the guiding device or rollers. Believe Industry Company also supply Downspout&Gutter Roll Forming Machine, Garage Door Roll Forming Machine, Pallet Racking Roll Forming Machine, etc as per drawings.